As a retail worker, I dread Black Friday each and every year. It's loud, crowded and, for every hundred nice people, there is one nutjob that makes your life a living hell as a worker. Anyways, while I've grown sort of bitter to the whole process, I must admit there are some stellar deals going on this weekend, both in store and online. While I haven't started my holiday shopping just yet, I have been looking around and decided to compile some of the best deals going on online this year. If you guys know of any other great deals going on, definitely let me know in the comments!! ASOS - 30% off full-price styles when you use code TGIBF. Ends 11/30 at 7 PM EST. BeautyBar - Save $15 when you spend $75, $35 when you spend $150 and $65 when you spend $250 with code BBCYBER14 (some exclusions apply). Ends 12/9. BeautyBar also always offers free 2-day shipping when you spend $49+. Beautylish - For every $100 you spend, Beautylish is awarding a $20 store gift card with your order (no code necessary). Ends 12/9 at 9PM PST. Diptyque - Perhaps one of my favorite deals, when you make any purchase online you'll receive complimentary 35g Myrrhe + Feu de Bois candles when you use the code FRIDAY14. Ends 12/2 (or while supplies last). Giorgio Armani - 20% off orders of $75+ with complimentary shipping. When you spend $150+ you can also get five Deluxe Samples. For both deals, use code FAMILY14. Ends 12/7. J. Crew - 30% off full-price styles when you use the code HOLIDAY. Ends 11/30 at 11:59 PM. 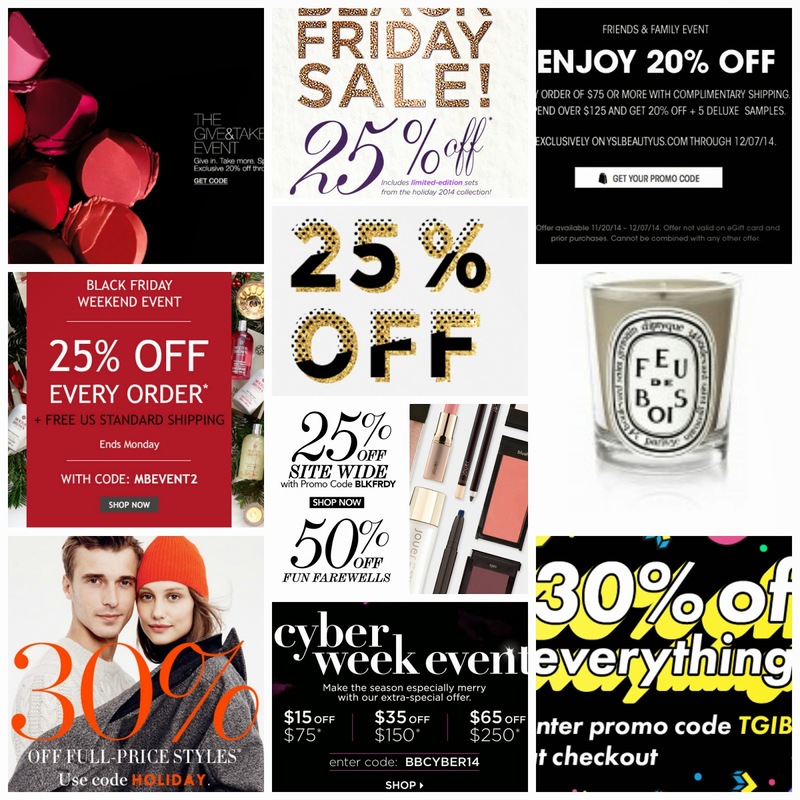 Jouer Cosmetics - 25% off site-wide when you use code BLKFRDY. Ends 11/30. Laura Mercier - 25% off when you spend $100+ (excluding holiday sets). Discount applies automatically. Madewell - 25% off your purchase when you use the code GIFTON. Ends 11/30 at 11:59 PM. Molton Brown - 25% off your purchase when you use code MBEVENT2. Ends 12/1. Sephora- Sephora is offering their annual $10 Beauty Deals all weekend starting on Black Friday and continuing through January 1. The specials are limited time, and will continue while supplies last. Space NK - For every $100 you spend you'll receive a $25 gift card (applied automatically at checkout). Ends 11/30. Tarte Cosmetics - 25% off site-wide when you use code FRIDAY. Ends 11/30. Yves Saint Laurent - 20% off when you spend $75+, plus five deluxe samples if you spend $125+, using code YSLGIFT. Ends 12/7.